XTBs give all investors access to greater choice, transparency , liquidity and capital stability around their financial future. XTBs give all investors access to the benefits of a wide range of corporate bonds from leading ASX-listed companies on ASX. Previously these bonds were only available to institutional investors. Unlike shares or hybrids, corporate bonds and XTBs over them can form part of the fixed income component of a diversified investment portfolio. XTBs are available on ASX, which allows you to track the value of your investments on a daily basis. 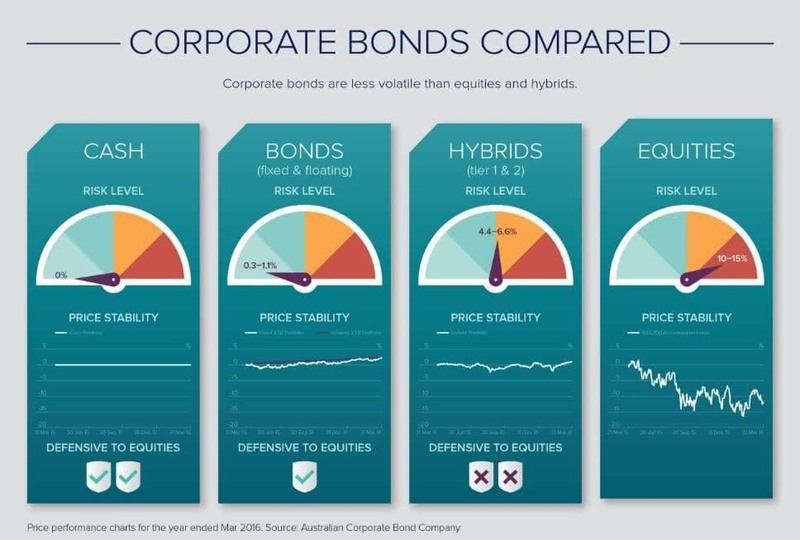 Bonds are typically less volatile than shares, hybrids or property prices. Exposure to corporate bonds offers investors a known income stream and a known outcome at maturity. XTBs give you 100% of the coupons paid and the full face value of the bond ($100) in cash at maturity. This is subject to no issuer default. July 1992 to December 2018, shares returned 9% p.a. & bonds 7% p.a. How many investments can tell you the exact income you will receive throughout the life of the investment? XTBs let you plan your cash flow to ensure it meets your needs. Our Cash Flow Tool maps out exactly when and how much income you’ll receive so there’s no surprises along the way. Add up to 10 XTBs to your portfolio and see how much income each one pays. Start building your first XTB portfolio now. For investors looking for regular income, XTBs provide a regular and reliable income stream. This allows you to match your income to your cash flow requirements. Currently in Australia over $929 billion sits in household deposits, including term deposits. However the rates investors are receiving are the lowest since records began. The income you receive on XTBs will generally be at a higher rate than the interest paid on term deposits and cash based products. Term Deposits may enjoy the benefit of protection under the Financial Claims Scheme. XTBs provide a listed fixed income alternative in a diversified investment portfolio, delivering capital stability, security and reduced risk. They are available across the bonds of some of the largest ASX listed companies, allowing you to select the XTBs that best meet your investment needs, based on investment term, type of income, or credit quality. Corporate bonds and the XTBs over them offer greater security of capital repayment than some other investments, such as shares and hybrids. As creditors to the bond issuer, they rank ahead of those hybrids and equity securities if a company is wound up. XTBs are traded on ASX just like shares, subject to liquidity. The process of buying and selling is simple and easy. If you already have a broker or financial adviser, there’s no additional accounts to open. If you don’t have a broker, you can find a broker via the ASX site. To find an adviser, visit the FPA site. SMSFs may access XTBs as part of an investment portfolio, providing a regular income stream. $157bn or 25% of current SMSF investments are in cash. You should also be aware of the risks of investing in XTBs. XTBs deliver access to predictable, regular income and capital returns from an investment of as little as $1500. Use our unique Cash Flow Tool to build a portfolio of XTBs and visualise your income and returns in 3 easy steps.